Description: Jan Johnson's second guide book begins where the first left off, with an ambitious goal of including all that was left out of the first. 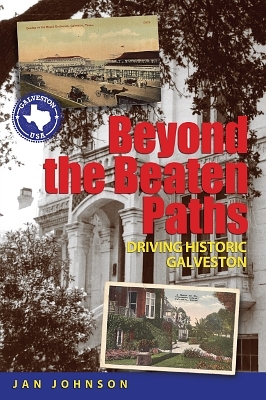 Readers will travel the Island's streets from the port to the gulf, meandering in and out of the East End before walking two areas: one of the downtown "Arts and Entertainment" Postoffice District and the Broadway Cemetery. Driving west to the airport through middle-class neighborhoods, the driving guide will lead you "Down the Island" to Jamaica Beach, then return you via a circuitous route to the very eastern tip of the Seawall. Along the way, happy wanderers will encounter the usual colorful and somewhat infamous characters who pepper the Island's past set among many vintage images. Viewed: 3,315 times since November 24, 2012.